The hottest season is here in Kyoto! This summer is much hotter than last years, I feel. Don’t you think so? Can’t people stop heating the globe? Should we put up with the summer getting hot? Oh..I have to stop saying some negative things. All about Gion Matsuri in July of Kyoto. 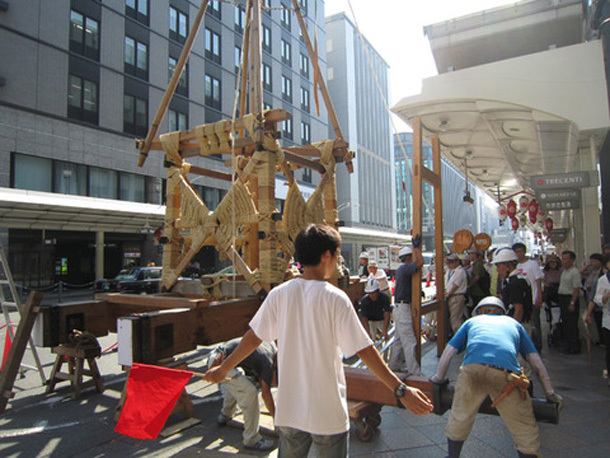 Floats, the main casts of Gion Matsuri have been started to constructed at 10th of this month. 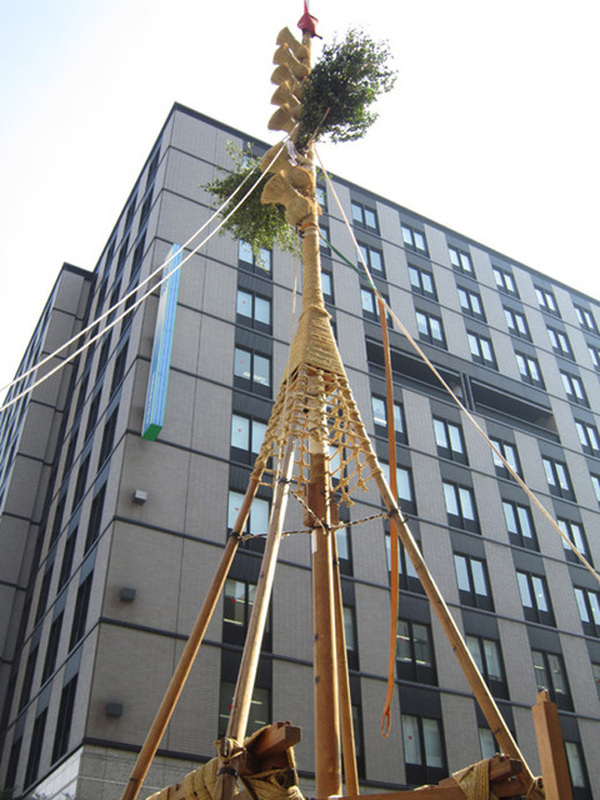 This photo is the constructed Naginata-boko float, which is the most popular and moves ahead of other 31 floats every year. People in the photo are all men or boys! 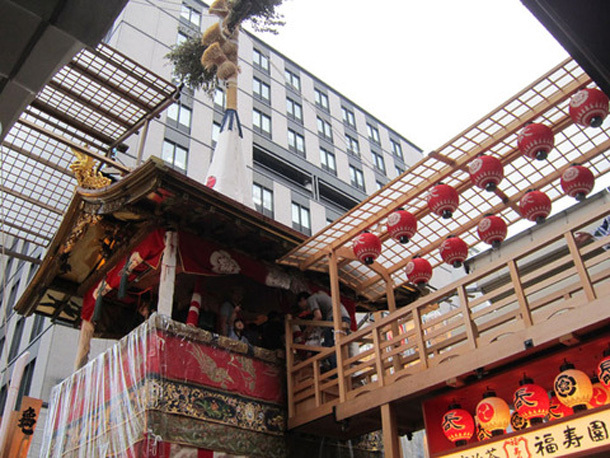 Women, even though girls, can’t come in this float same as the situation of the sumo stage! Can you look at the float covered by vinyl in the photo above? Every year, especially these summers have lots of heavy shower with thunder. The beautiful textile decorated the floats are prevent from wet and damaged by thunderstorm. Not only for floats, but also for people, terrible summer weather these years is seriously dangerous. Lots of people are damaged by heat and transported to the hospital by ambulance. And some people are died because of thunder. So scary.. The highlight of Gion Matsuri is tomorrow, called Yamabo-junko. 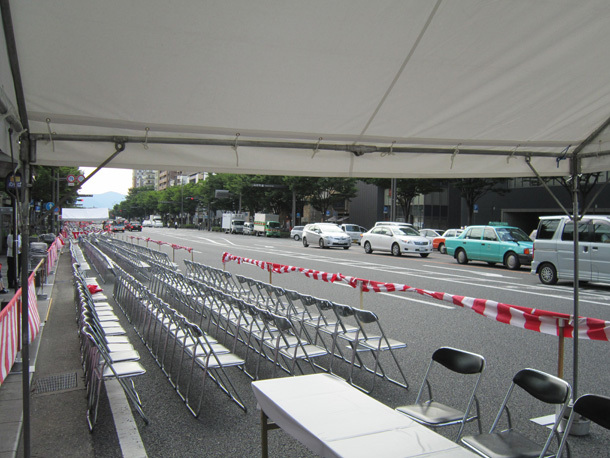 (Moving floats) The reservation seats are ready for set. I hope all is safely done.